Getting the Call: Meet Mollie Campbell! 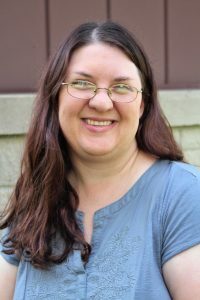 We’re so thrilled to introduce Mollie Campbell to the Love Inspired Historical Team! I’ve read inspirational romance for almost as long as I can remember. But write it? I never thought I could do that! After earning a Bachelor’s degree in management and working for several years, I married a great guy and we had two babies. Every time I found myself at a point of change in life, I always wondered if I could write a book. And I always quit before getting very far. I’ll never forget the night I decided to try it for real. After babysitting in our home for over a year, I found myself at another career turn. One January evening, I was out running an errand by myself. With two young kids, how often does that happen? I do my best thinking when I’m driving and this time, an entire story formed in my mind. I could see the widowed heroine, Coralee, standing in the apothecary shop she’d inherited from her father, wondering how she was going to save the failing business. And then there was Jake, her childhood sweetheart, the man she thought she’d marry until he broke her heart by leaving. She was fighting for her livelihood and her father’s legacy, he was fighting to keep his dream alive. And orphaned twins would bring them together. It was pretty clear that I would never find a better time to try. I was already at home with my kids and they had just grown old enough to entertain themselves some of the time. My oldest would be starting school in a few months and I would have extra time to work on writing. As soon as I got home, I sat down to research. I devoured everything I could learn about writing inspirational romance. But I was mostly writing on instinct and I had no idea if that would be enough. 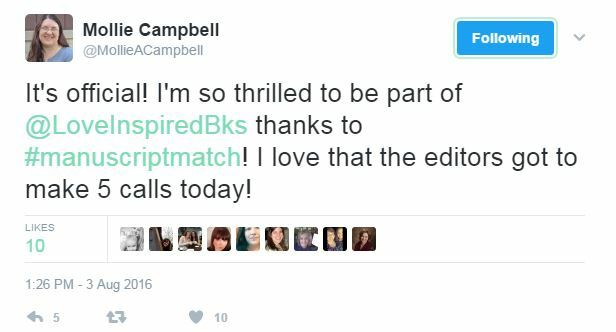 I hadn’t gotten very far into the story when Love Inspired Historical announced their Manuscript Matchmakers contest. There was a chance to get feedback from editors on my idea, one little piece at a time? The opportunity was too great for a brand-new writer to pass up. To my surprise, I met every deadline and advanced through all the stages. I couldn’t believe it. But surely there was no way I would get “the call” for my first full manuscript! I was hoping for excellent feedback and the chance to fix issues and submit the book again. But I still memorized the area code for New York, just in case. Sure enough, it was editor Shana Asaro with the best possible news. 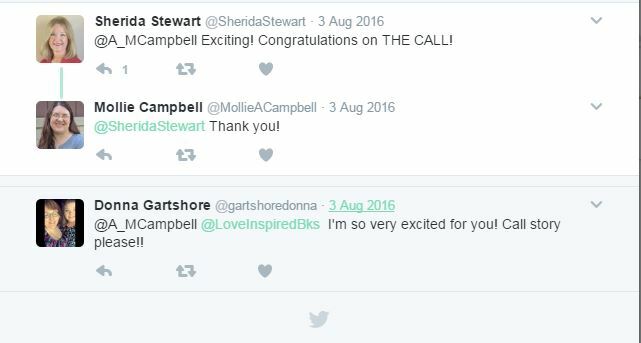 And I got to share the excitement with four other new authors who also got calls that day! I received a contract and made it through rounds of editing that made my little story better than I could have imagined. It’s been a wonderful, stretching process. Best of all, I get to share Jake, Coralee, and the twins with the world! 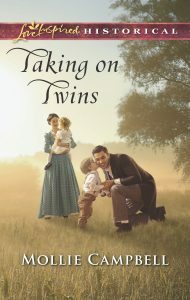 And don’t miss Taking on Twins, available June 2017 from Love Inspired Historical! Congratulations. What an inspiring call story. Love your cover, btw. Praying for continued success, Mollie! Thank you, Chrissie! Glad you like the cover! What an inspiring story! Congratulations on your achievement! Read http://bigessaywriter.com/blog/netflix-punisher-season-one-is-coming-are-you-ready to relax a bit. It is really a great work, which allowed the author to demonstrate her experience. You can use the service http://bestessay-writing.services/ to improve the quality of the publication.